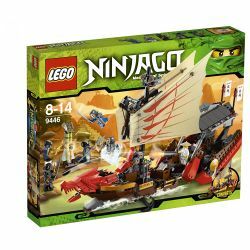 9446 Destiny's Bounty is a Ninjago: Masters of Spinjitzu set released in December 2011. It includes Kendo Jay, Kendo Zane, Lord Garmadon, Sensei Wu, Skales, Slithraa, a small shrine which holds the Hypnobrai Snake Staff and the Destiny's Bounty, which is the ninja's new headquarters. It also includes one firing cannon. This is a description taken from LEGO.com. Please do not modify it. Sail into an epic battle on board Destiny’s Bounty! On a dangerous journey aboard Destiny’s Bounty, an ancient shipwreck, Sensei Wu and the ninjas have located the powerful golden Hypnobrai staff deep inside of the secret snake shrine. As they land the flying ship in the water to seize the staff, Sensei Wu, Zane and Jay get a scaly surprise from the Hynobrai General, Skales, and his accomplice warrior, Slithraa. Sensei Wu fires the ship’s cannon into the battle until his ancient enemy, Lord Garmadon, appears. Can Sensei Wu protect the Ninjago treasures on board without the help of the ninjas? Choose your battle in an epic showdown where the fate of the Ninjago world hangs in the balance! 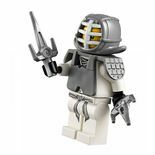 Includes 6 minifigures: Sensei Wu, Kendo Zane, Kendo Jay, Lord Garmadon, Skales and Slithraa; Destiny’s Bounty ninja ship, snake staff shrine, golden Hypnobrai staff and 16 weapons. Transform Destiny’s Bounty into a flying ship! Fire the cannon shooter with 4 cannonballs! Protect the secret treasure on board at all costs! Stow the ninja weapons in the ship’s weapon racks! Launch the working anchor when you reach the shrine! In Ninjago: Masters of Spinjitzu, the Destiny's Bounty is larger and houses several ninja training equipment and a command center. Facts about "9446 Destiny's Bounty"
Sail into an epic battle on board Destiny’s Bounty! This page was last edited on 16 August 2016, at 11:10.